This Bronze Age pot, known as a food vessel, was found in a cist burial at Easter Moy farm near Brahan in Easter Ross. It was discovered in 1907 when digging for materials for road repairs. For the time, the burial was quite well recorded, described as aligned east-west, and measuring 3ft 1.5 inches in length, 21 inches wide and 15.5 inches in depth, with the floor carefully levelled and smoothed, and an inch and a half of sand and clay spread over its entire surface. Along with the food vessel, four small flints, including a scraper, and fragments of charred wood were recovered. Fragments of bone and a worked flint are in the National Museum of Scotland. The food vessel is on display in Dingwall museum, on loan from Brahan estate. 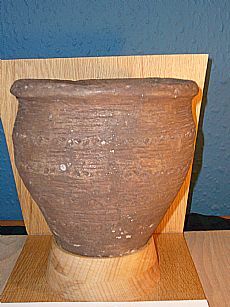 A number of Bronze Age cist burials have been found in the area, some with beaker pots, others, as in this case with a food vessel. The food vessel has been decorated.